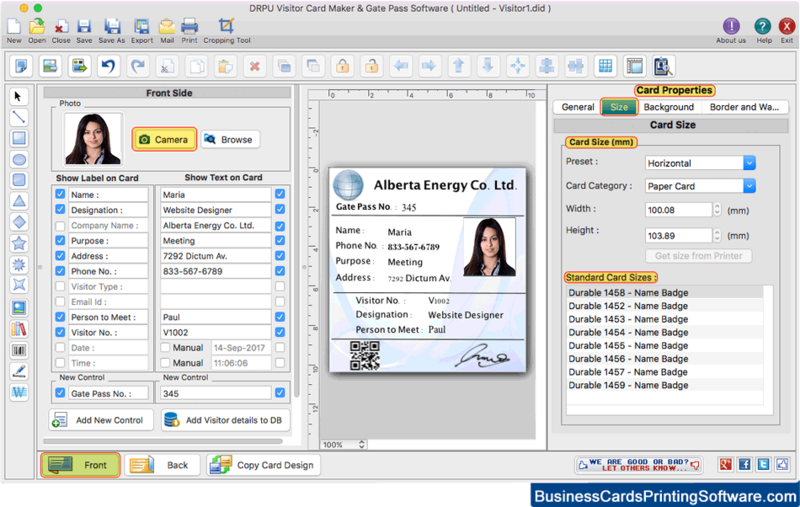 Mac-compatible Visitors ID Cards Maker include everything that you need to design and print photo added Visitor ID Cards on Mac machine. Software provides option to save visitor's details to the database for future reference. Software facilitates mac users to search particular visitor information according to Name, Address, Company Name, Email, Phone Number, Visitor Number, Date Range etc. Software provides Camera setting option to capture visitor's photo while designing ID card or You can also browse the path of that image which you want to add on your visitor ID Card. E-mail setting option to send designed ID cards to the specified email address. Software provides Pre-defined templates for quick designing of Student ID Card. Image Cropping Tool to crop images while designing visitor ID Card. You can save visitor's records to view it later as well as export visitor's records in Excel data file.